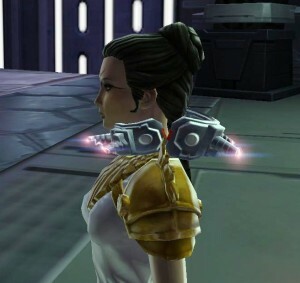 Whilst doing my powertech’s class story, I noticed that Gault had a very shiny gun. I have no idea what “Missing Granny” means in tech-speak, but I find it hilarious. In completely unrelated news, I logged in the other night to find myself looking like this. A shock collar? What the hell? Had I been captured for bounty hunter week? It was a debuff without duration, so in theory it could have lasted forever (but a relog cleared it). 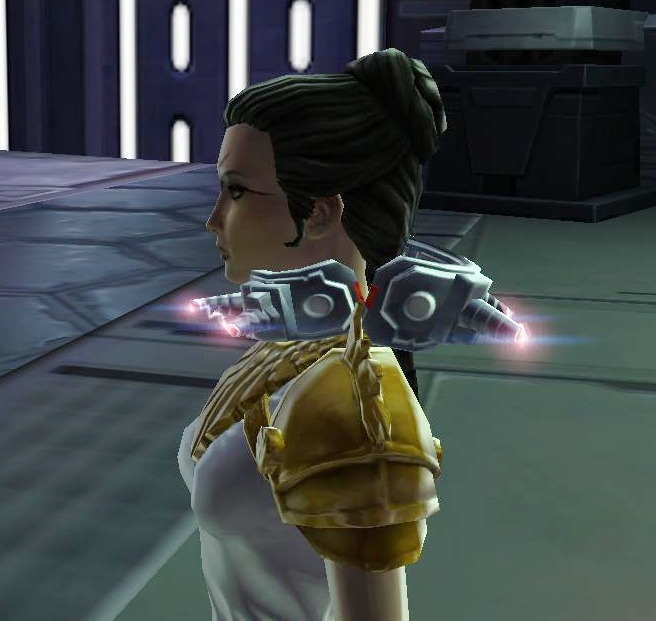 From googling, it turns out that if you’re on the Imp-side Corellia quest to collar some Selonians, you can use said collar to collar non-Selonians. Oh ha ha…. 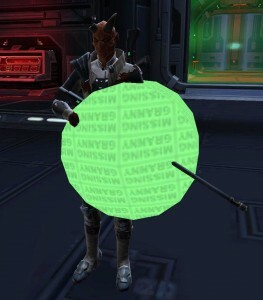 (I am totally doing that with my next toon that gets to Corellia). When my first sent was visiting That Sithy Place (no, I don’t mean Scourge’s quarters) at the very end of the class story she found Doc-in-Distress covered in “Missing Granny” from mid-chest to knees. Head canon immediately dictated that “Missing Granny” was the code name for “Dangerously Virulent Strain of Bothan Nether Rot” sooooo…my dps sage runs with Zenith about 99% of the time but every once in a while she’ll drag Tharan away from Holotart and into some instance or other hoping that “Missing Granny” will make a reappearance (a nice break in the dailies/weeklies tedium, the Let’s Infect Tharan With Missing Granny Minigame). There’s always hope that Tharan and Quinn will have a SGR with each other and leave the rest of us alone.